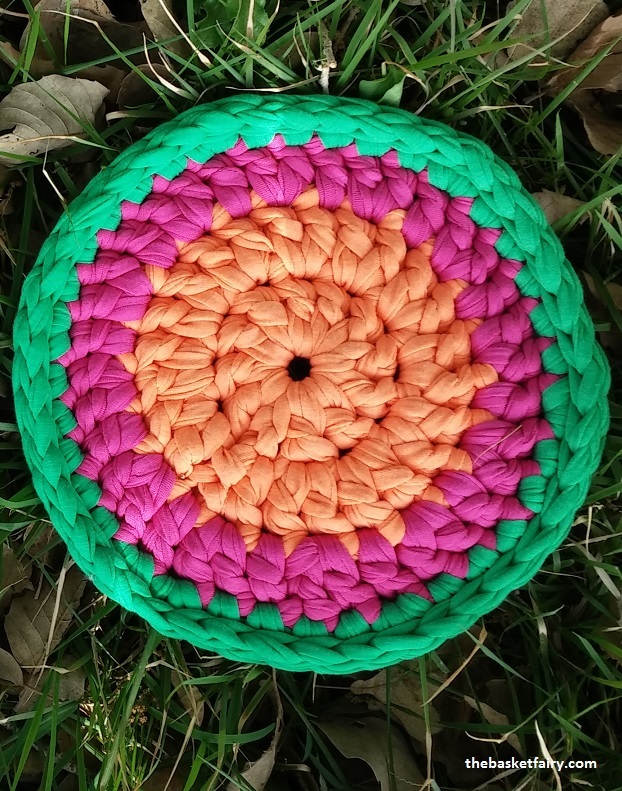 These colorful trivets were made from recycled t-shirts! But first, you need to know how to cut a t-shirt into fabric yarn. This is a good tutorial. One t-shirt is about enough for one trivet. 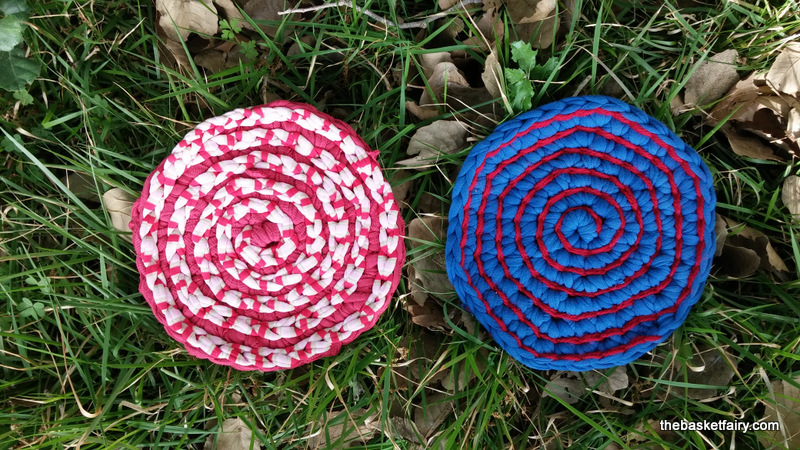 For the trim, use a different colored strand of anything (of course, left-over bits are great) – I used one strand of striped ready-made fabric yarn for the red-and-white trim, and ordinary yarn for embellishing the blue trivet with red. Just one thing: You don’t want delicate fabrics or yarns for this. Remember, you’re going to set a hot pot base on it, so make sure it doesn’t melt away your trivet! Now, here’s for my very secret, very complicated fancy pattern! Using a no. 12 crochet hook, make a magic ring. Row 1: Crochet 6 sc into ring. Row 2: Working in a spiral, continue and crochet 2 sc into each st (12). Do you know what working in a spiral means? It means you do not close off each round with a sl st, but instead, go right ahead and crochet the first 2 sc of the next round into the first st of the previous round. Do this at the end/beginning of each and every row. Place a stitch marker after the last st of every row to mark the beginning of a new row. Row 5: *2 xc into 1st st, 1 sc into each of 3 following sts* repeat 6 times (30). Finish off with an invisible join and weave in the ends. Note: If you run out of t-shirt yarn in the middle of the last row, you can finish off right where you are. Or, if you have enough for more than the number of rows in the pattern (or for that matter, less), you can just continue crocheting until the end of the strand. If you want to insist on (almost) perfect roundness – go ahead and finish off at the end of a row. However, the spiral technique skews the circle a little anyway (if you take a close look you’ll see what I mean). So when you’ve finished, take a look and see if the shape you’ve obtained is the one you want, or continue a little if you wish until it looks just right to you, as long as the strand lasts. Start with a sl st at the top of the second sc you made, in the space between the rows. 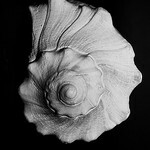 That will start you very near the center of the spiral. Continue with sl st in the space between the rows, one sl st for each sc in the row below it. Draw out the sl st’s as much as you need so that your project lays flat, because the strand you use may not be identical to the one you used to crochet the base. 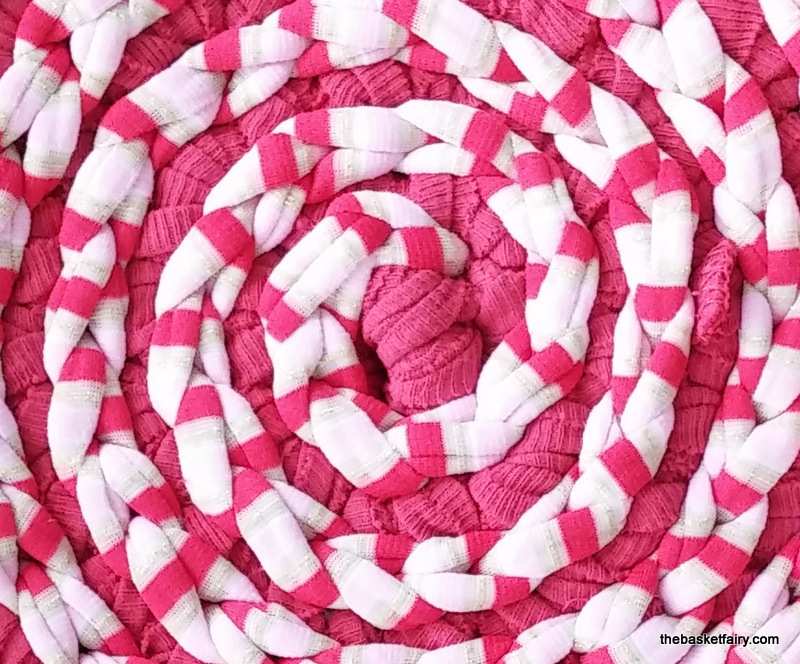 You will be stitching in a continous spiral between the rows. 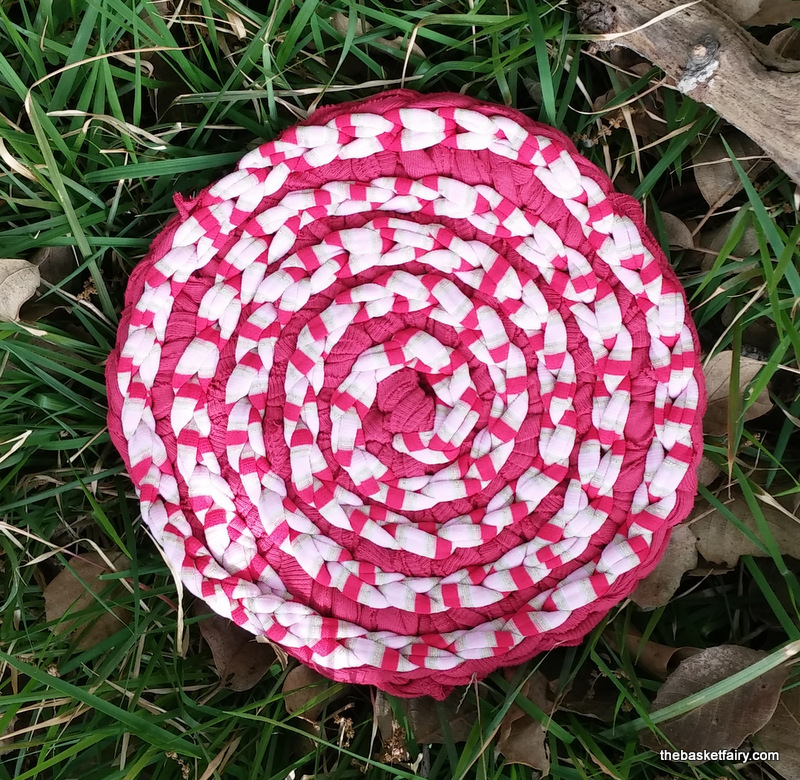 If you use a thinner strand, such as yarn, it will accent it between the rows (as in the blue and red trivet). 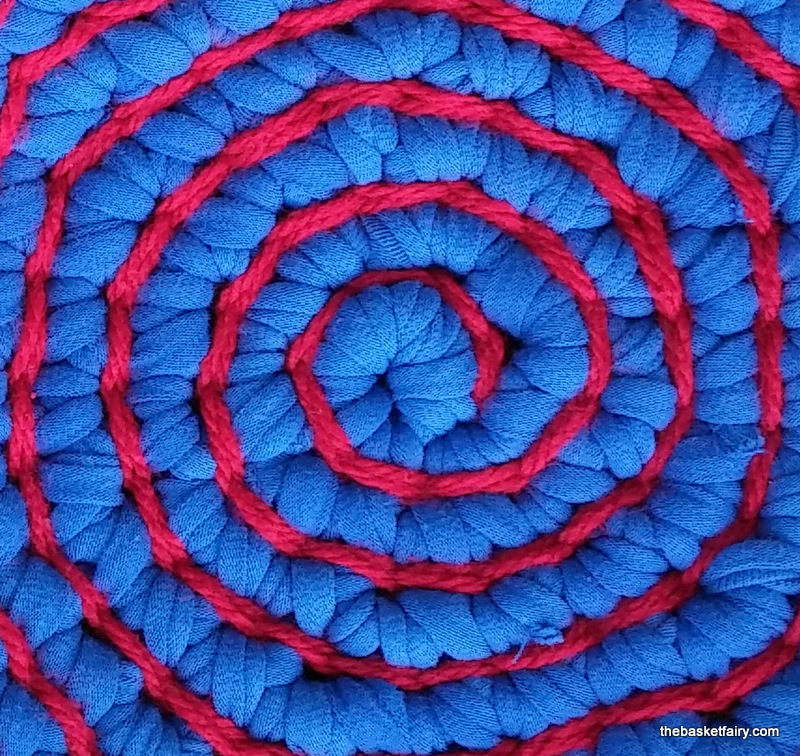 When you reach the end of the spiral, draw out the strand, move it to the back, and weave in the end. 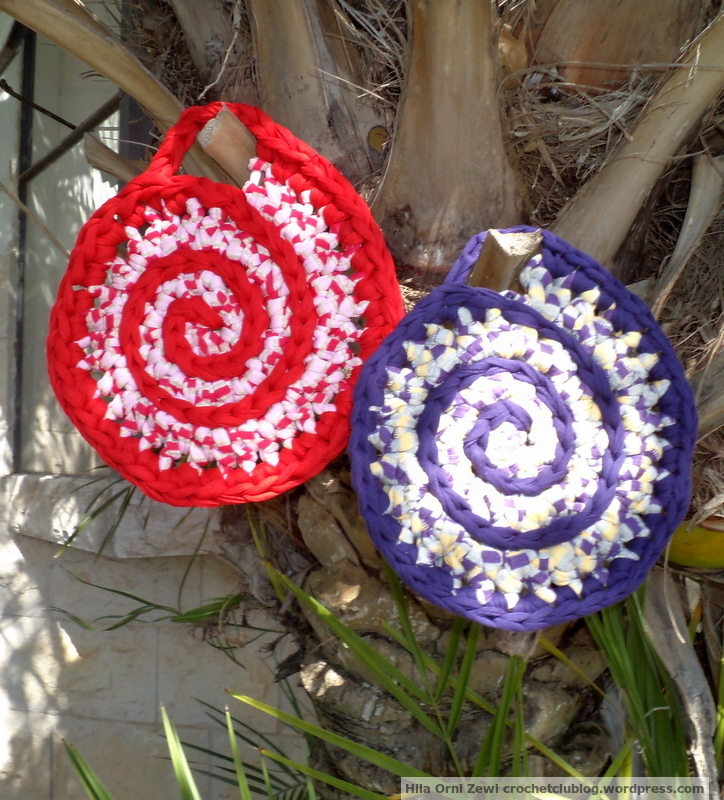 This entry was posted in Projects and tagged big hook crochet, crochet, crocheting in a spiral, fabric yarn, rag crochet, recycling clothes, t-shirt yarn, tarn, textile yarn, trapillo, trivets, upcycling, סריגה בטריקו on May 30, 2016 by The Basket Fairy. I love Helena’s colorful and cheerful designs. 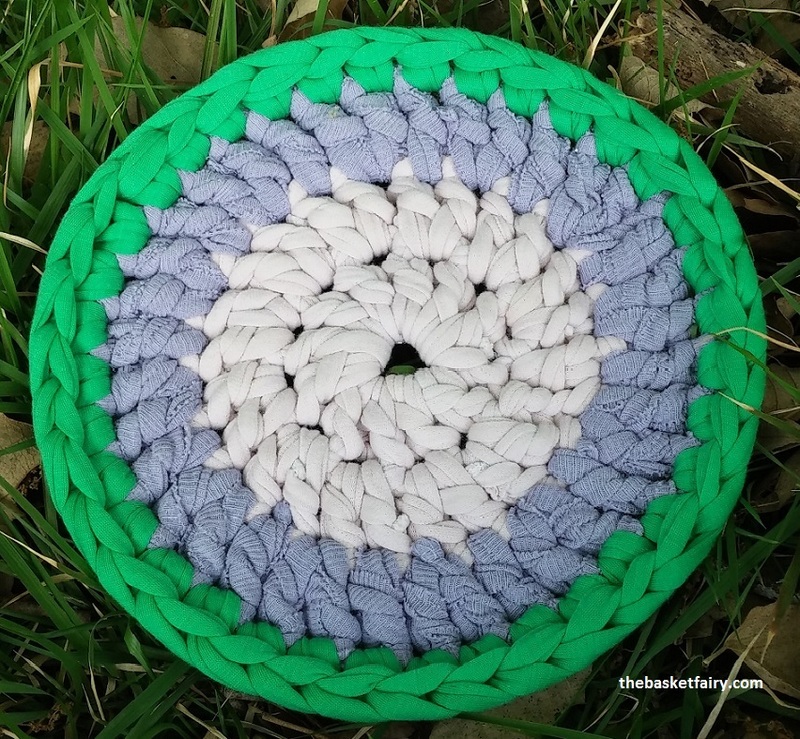 These trivets are made by crocheting half-double crochets in a spiral, then slip-stitching around from the middle in an accent color. When you get to the edge, you switch to double crochet. It sounds simple – and it is! But Helena’s designs always have that little magic something to them – in this case, notice how the slip stitch accents the spiral pattern, but at the same time fills in the gaps between the stitches to create a firmer fabric. The slip stitches cover a bit of the stitch, making it shorter, but when you switch to double crochet, more of the stitch is exposed. The result is an organic-like increase in stitch height as you reach the outer row. Since I don’t understand Portuguese, it took me a bit to figure out how this was made. I made the purple-and-yellow one first, trying and retrying until I figured out that little bit with the stitch height… And when I got it, I just had to make another one! In case you don’t speak Portuguese either: It says on Helena’s blog that you can hang them in your kitchen as decor, and if you make them from thinner strands of yarn, you can use them as pot-holders too (assuming I got what Helena meant, with a little Spanish to help me out). These are made from pretty thick fabric yarn, so they won’t work as pot-holders but I already checked and they are good for keeping the pot warm and the table safe. One note: Make sure you have high cotton fiber content in your “yarn” – you don’t want synthetics coming in contact with a hot pot base! 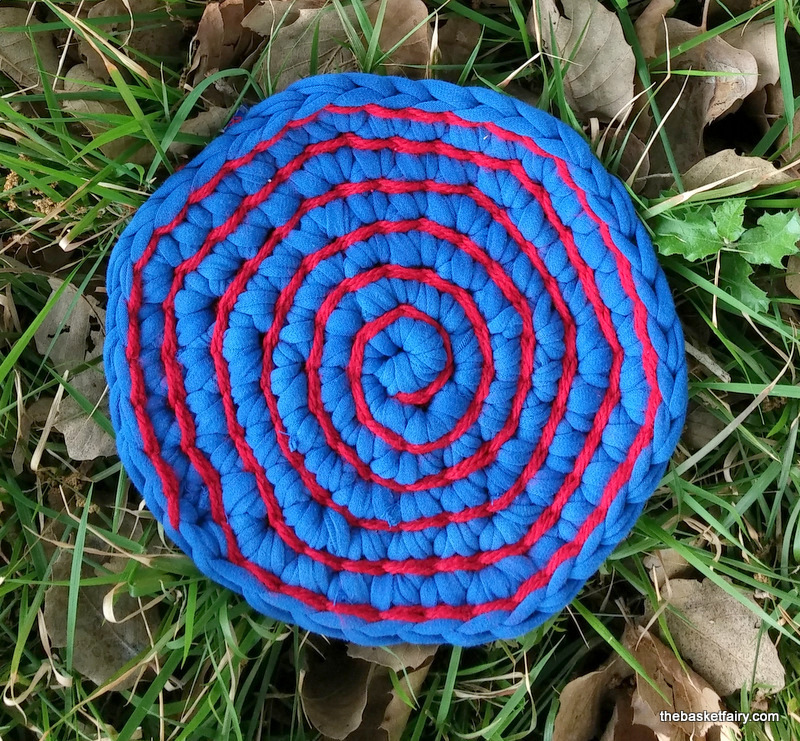 This entry was posted in Projects and tagged crochet, crocheting in a spiral, DIY, fabric yarn, Projects, t-shirt yarn, tarn, trapillo, trivets, Zpagetti on August 19, 2014 by The Basket Fairy.